In an effort to better integrate the University’s marketing and communications activities, two longtime staff members have been asked to reconfigure operations and lead these efforts across the entire institution. The UT Board of Trustees recently approved the new roles of Esther Fabian, associate vice president for branding and creative services, and Tobin J. Klinger, associate vice president for university communications and marketing operations. 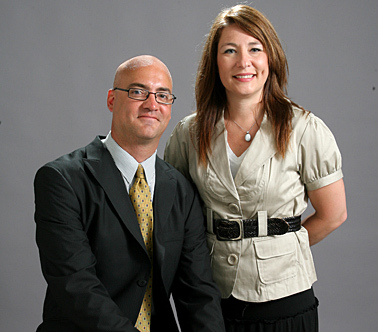 Previously, Klinger served as senior director for university communications, and Fabian was director of health-care marketing. Fabian joined the Medical College of Ohio in 1999. Since that time, she has held roles in alumni relations and development. On the Health Science Campus, Fabian led an office charged with internal and external marketing, social media and Web initiatives for UT Medical Center. She successfully worked with the offices of Marketing and University Communications on Main Campus to integrate marketing and branding strategies of UT Medical Center with the overall institution brand. Projects have received awards from the American Association of Medical Colleges, Council for Advancement and Support of Education, and Healthcare Marketing Report. Klinger started as a media relations coordinator at UT in 2001. He also has been media relations manager and served as interim executive director of public relations and marketing. His accomplishments include shaping the vision and implementation of the myUT page as an internal communications hub; launching social media efforts; leading updating efforts of the UT homepage; numerous local, regional and national media placements; and the reinvention of the town hall meeting. This entry was posted on Friday, June 18th, 2010 at 5:20 am and is filed under UToday .